When any interested party makes a reservation with Gaursa Mobility SLU, they need to state their name and surname(s), telephone number, address and driver’s license details. This information will be used by Gaursa Mobility SLU to process the reservation and to contact the User in the event of any incident or if they are unable to send the electronic confirmation of the reservation request. Interested parties must also indicate the type of payment card they will use to pay for the service, as well as the number and expiry date of said card, to enable Gaursa Mobility SLU to process payment for both the service and any additional costs. All the information provided will be included in an automated Personal Data file created by Gaursa Mobility SLU with the aim of maintaining and managing the contractual relationship established with the customer, as well as for the purposes of carrying out information and marketing activities for the car hire service and related activities. Any charges related to time and mileage, calculated in accordance with the tariff stipulated on the front page of the contract, or the tariff currently in force. Charges resulting from damage to the vehicle. In such cases, the hirer shall assume sole responsibility for any damage suffered by the vehicle up to the sum specified as the excess limit corresponding to the reservation, in accordance with the group to which the vehicle belongs. Charges stemming from the total cost of any repairs or replacements resulting from damage excluded from the insurance cover, such as: damage to the inside of the vehicle, roof, tyres and undercarriage. Charges corresponding to fuel consumption, with a surcharge of €20. Charges corresponding to expenses incurred due to loss of documents, tools, keys and accessories, which are missing from the vehicle at the end of the hire period. Charges corresponding to the sum of any fines imposed, along with an administrative charge of 10% of the fine as compensation for the administrative work involved. If the hirer were to request a copy of the fine notification, Gaursa Mobility SLU undertakes to send them one. Charges corresponding to any extra cleaning work required on the vehicle as the result of someone having smoked while inside. Upon collection of the vehicle, the customer must present the same credit card with which they made the reservation in order to cover any sum to be paid in advance that was not included in the pre-paid amount. Furthermore, a hold will be placed on the customer’s credit card to a sum to be determined by Gaursa Mobility SLU at the moment of collection. Said hold will not be removed until the vehicle has been returned. Gaursa Mobility SLU reserves the right to charge to the credit card provided any expenses incurred by the customer from the moment they collect the vehicle to the moment of its return that were not included in the sum charged upon collection. If the customer were to cancel the reservation 48 hours prior to the agreed-upon collection date, Gaursa Mobility SLU shall reimburse the entire sum paid to date. If the customer were to cancel the reservation less than 48 hours prior to the agreed-upon collection date, Gaursa Mobility SLU shall reimburse the prepaid sum minus a 10% cancellation fee. Cancellation requests must be sent in writing to Gaursa Mobility SLU, either by email at: rentacar@gaursa.com or by fax on 944393775. If the customer fails to notify Gaursa Mobility SLU of their intention to cancel their reservation in the proper manner through the established means, no reimbursement shall be issued. Gaursa Mobility SLU will not reimburse any prepaid sum in the event of the customer failing to collect the vehicle on the agreed-upon date, except when the customer notifies Gaursa Mobility SLU in writing the day before the collection date, either by email at: rentacar@gaursa.com or by fax on 944393775. Once the reservation has been confirmed and upon signing the contract, the customer must pay the entire sum of the hire price, including any additional services contracted, by credit card. All cancellation requests must be sent in writing to Gaursa Mobility SLU, either by email at: rentacar@gaursa.com or by fax on 944393775. If the customer fails to notify Gaursa Mobility SLU of their intention to cancel their reservation in the proper manner through the established means, no reimbursement shall be issued. The hire price includes compulsory vehicle insurance coverage and the complementary civil liability coverage for damage to third parties caused by the use and circulation of the vehicle, with the exception of the excess charge (said excess will be held on the credit card used to pay for the vehicle hire). If you would like to purchase an excess waiver, you will have to pay the extra amount due (excess waiver). These covers are guaranteed by the insurance company with which the vehicle hire company has contracted its insurance policy, and are subject to that stipulated in the general and specific conditions of said policy. The insurance policy is rendered null and void if the vehicle is driven under the influence of alcohol or drugs. In such cases, the hirer is liable for the full extent of the damage caused. This policy does not cover any damage to or loss of luggage, merchandise or personal belongings transported in the vehicle, nor does it cover any total or partial loss in the vehicle due to theft and/or vandalism and/or traffic accidents. The excess waiver is an optional service provided directly by the hire company which frees the hirer from any economic liability only in the case of damage caused to the vehicle as the result of a traffic accident and immobilisation charges. Failing to purchase an excess waiver for damage resulting from a traffic accident means that the hirer is liable for the excess amount and any resulting immobilisation charges, estimated as the number of days required to repair the vehicle as stated on the certificate issued by the repair workshop and in accordance with the price stipulated in the contract. The excess waiver does not, under any circumstances, cover damage caused to the vehicle’s undercarriage, tyres or rims; nor does it cover any damage to the inside of the vehicle or any other damage to the vehicle caused by driving in unsuitable places, such as beaches, forest roads or mountain tracks, etc. Gaursa Mobility SLU undertakes to deliver the vehicle in good general working conditions, with no visible defects. The hirer is under the obligation to return the vehicle in the same condition, with all documents, parts and accessories, to the place and on the date and time stipulated in the contract. Failure to do so will render the insurance coverage null and void and, moreover, will leave the hirer open to possible charges of misappropriation, as established in article 535 of the Spanish Criminal Code. Gaursa Mobility SLU may retake possession of the vehicle at any time without advance notice being given to the hirer and at their own expense, if it detects that the vehicle is being used in violation of the terms of this contract. For transporting passengers in exchange for money. 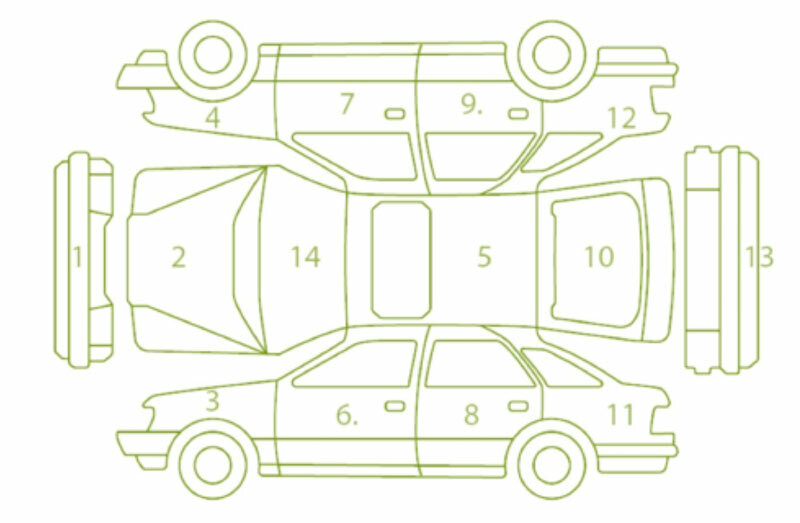 For transporting more people than the maximum number specified on the vehicle’s technical specifications sheet. For transporting merchandise in exchange for money, except in the case of trucks and vans. For participating in races, rallies, trials or other competitions. While the driver is under the effects of alcohol, drugs or any other substance which affects their awareness and reflex capacity. To violate any traffic rules (the hirer should be aware that committing any traffic violation constitutes a breach of the terms of this contract). Unless the minimum requirements specified in our list of current tariffs regarding age and possession of a valid driver’s license are complied with. By anyone who has not previously been authorised by Gaursa Mobility SLU and included in this contract, or anyone who does not comply with the age and possession of a valid driver’s license requisites. For driving or being driven in restricted areas, specifically on airport runways, airport service roads and associated areas. For driving or being driven on roads not suitable for circulation (roads suitable for circulation include: public domain roads, garages and private roads not dedicated to industrial or agricultural use). Failure to comply with the aforementioned conditions of use will render the hirer liable for any costs incurred due to the transfer of and/or repairs to the vehicle. The hirer is under the obligation to inform Gaursa Mobility SLU within a maximum period of 24 hours of any accident or damage to the vehicle. They are also under the obligation to take all possible steps to avoid greater damage, and are responsible for any consequences which may arise from any delay in the fulfilment of this obligation. Hirers are also liable for any legal or out-of-court expenses, including the cost of legal counsel and clerking fees, incurred as the result of any claim for breach of contract. This contract comes into force at the time and on the date specified on the vehicle collection forms, and is signed here as proof of both parties’ agreement with its terms and their decision to submit any dispute that may arise to the jurisdiction of the DURANGO courts. The hirer accepts full responsibility for all fines and any other consequences arising from traffic or parking violations committed during the vehicle hire period, even if the sanctions are imposed subsequent to its return. The company Gaursa Mobility SLU, with registered offices in IURRETA, in its capacity as the entity responsible for the file, will include the personal data provided by the hirer into its files for processing. The hirer may exercise their right to access, correct, eliminate and oppose said data at the specified address. The purpose and prior use of both the data themselves and their processing is to carry out the procedures necessary to provide the hirer with a hire vehicle, as well as to engage in other types of commercial communication activities regarding new services and promotions offered by any of the companies in the GAURSA Group, through any medium, including email and SMS. Refusal to provide the required data will make it impossible for us to respond to the hirer’s request. In any case, the hirer may state their wish not to receive the commercial communications outlined above. Failure to oppose the data use and processing operations outlined above, including the ceding of data, implicitly implies the unequivocal, voluntary and informed consent of the interested party.